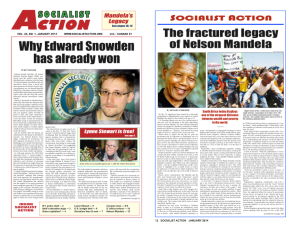 Socialist Action is launching a national election campaign, with National Secretary Jeff Mackler as the party’s candidate for U.S. president, and Karen Schraufnagel as its candidate for vice president. Jeff Mackler has spent a lifetime fighting for the working class and social justice. He is a veteran opponent of U.S. imperialist wars and interventions, and a leading environmental and social justice activist. From the Vietnam era until today, he has organized and chaired many huge rallies against U.S. wars. He is a founder of the Northern California Climate Mobilization, and has played a major role in organizing Bay Area climate change protests. A former teachers union leader, Mackler was the organizer and longtime elected officer of the AFT and CTA locals in Hayward, Calif. He is the director of the Mobilization to Free Mumia Abu-Jamal, and the author and editor of close to 25 books and pamphlets on labor and social history, politics, civil liberties, and economics. Mackler was Socialist Action’s candidate in California for the U.S. Senate in 2006. Karen Schraufnagel is a member of Socialist Action’s National Committee and organizer of its Twin Cities branch. She is a founder of Minnesotans Against Islamophobia, and is active in the anti-Zionist Boycott, Divestment, and Sanctions movement and the animal rights, antiwar, and environmental movements. Abolition of all racist, sexist, and homophobic laws and practices. For a workers’ government! Abolish capitalism! For socialism! Join us in supporting Jeff Mackler and Karen Schraufnagel in fighting for the working class and against the twin parties of U.S. capitalism. Photo: Jeff Mackler speaks at recent Socialist Action-initiated forum on the U.S. elections, at Riverside Church in New York City.